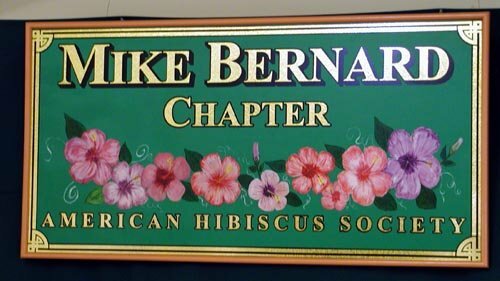 Father Robert Gerlich, is an avid hibiscus breeder, professor of history at Loyola University and President of the New Orleans Chapter of the American Hibiscus Society. Father Gerlich runs a joint hibiscus breeding program with Bobby Dupont at Dupont Nursery. One of the “hot” topics of discussion over the last few years has been the “necessity” of grafting hibiscus. Often plants that have been hybridized to produce better fruit or flowers do not always exhibit the same vigorous growth characteristics as their "old fashioned" cousins. In fact, some modern crosses of tropical hibiscus perform poorly on their own root systems, while others fail to root reliably (Red Snapper is a good example of the latter). And a few cultivars, such as Kona, do root and grow well, but are so prone to fungal diseases that they are practically impossible to keep alive for an entire season. In nature, cultivars with these limitations would not have survived. But because of their appealing floral characteristics, growers enhance their viability by grafting. But there are a goodly number, perhaps 80-90% of cultivars, that do reasonably well on their own roots. Mr. Dupont will not propagate a new seedling if it does not do well on its own roots and an increasing number of hybridizers discard plants that require grafting. So, one might well ask whether it is worth learning how to graft, especially when it is so easy to ask someone else to graft the one or two plants that one might want. My response is YES! I view grafting as a part of the FUN of the hibiscus hobby. I realize that it isn’t for everyone. Some people will find the use of a knife in close proximity to their fingers too frightening; others simply lack the handeye coordination necessary to achieve a successful graft. But if you have the patience, and enjoy the challenge, grafting adds another dimension to the hibiscus experience. And so I would suggest that you learn the basics and, if you desire, give grafting a try. You might discover that you enjoy the experience. Grafting is the joining of the living tissue of one plant (scion) with the root system of another (rootstock). This allows one cultivar, with desirable characteristics, to take advantage of the vigorous root system of another. The stronger root system permits grafted plants to assimilate more water and nutrients, tolerate a wider variety of soil and weather conditions and resist disease more successfully. As a result, grafted plants are generally faster growing, produce larger flowers, live longer and flower sooner than plants of the same variety grown on their own roots. The Hibiscus Handbook, published by The American Hibiscus Society, has a full description of grafting on pgs. 19-26. The following is a summary adapted from the presentation found on those pages and supplemented by personal observations. scion wood (wood from the desirable cultivar to be propagated). It is helpful to nip the ends of the branch from which you are planning to get the scion wood two weeks before you intend to graft. This allows the plant to chemically signal the side shoots on the branch to start growing. This “activated wood” is more likely to form a good “bridge” with the scion once it is grafted. rootstock (at least .75 cm in diameter) Also called "understock", the rootstock provides the root system utilized by the scion of the new graft. Consequently, rootstock must be vigorous on its own roots. Although any hardy garden hibiscus will serve this purpose, some cultivars root faster and accept grafts more readily. Brilliant, Albo, and President make good rootstock, but Pride of Hankins is presently the most widely used because it roots quickly and tolerates over-watering better than some of the others. Rootstock should be well fertilized and in active growth before grafting. broad spectrum fungicide for presoaking the scion and cleaning clippers, etc. GRAFTING MATERIALS: Most art supply stores have good selections of Exacto knives and blades. Thick-handled Exacto knives that use No. 2 blades are ideal for initial cuts. Smaller size knives and blades are handy for making adjustment cuts. Rubber bands, labels and grafting wax can be purchased from A.M. Leonard (1-800-543-8955). The grafting process itself is simple, but not so easy to explain. But no matter what type of grafting technique one uses, the goal is always the same -- merge in green cambium layer of the rootstock with the green cambium layer of the scion. This is done by slicing a wedge cut in the rootstock and “wedging” in a piece of scion that has been properly cut to form a matching angle. The key is to align the two pieces so that the green cambium layers exchange water, minerals, etc. Once the two pieces have formed a union (grown together), one cuts off the rootstock above the graft. This allows the root system to put all the energy into the new, desirable cultivar (scion). It is especially important to take care of a graft during the first 3 or 4 weeks as the graft heals and forms a “bridge” between the scion and the rootstock. I cover my grafts (not the entire plant) with a plastic wrap that builds a miniature “green house” and helps prevent the graft from drying out. This is not absolutely necessary, if you are able to keep the graft sufficiently misted. But I personally don’t have a misting system for this purpose and I do not have the time to “fuss” over the plants several times a day with an atomizer. I have found that this “tenting” system with plastic wrap is a fairly good substitute for more elaborate misting systems. Of course, newly grafted plants should not be placed in an exposed place, as the sun and wind will often dry out the graft before it has time to take. Place new grafts in a bright, but protected area. Be careful when watering not to get the plastic wrap wet. This will cause it to stick to the wood. In which case, there will be a lack of air movement and excessive moisture. These are conditions that promote fungus growth and result in a failed and rotting graft. GRAFTING DEMONSTRATIONS: If you are Web wise, you might wish to consult: http://www.hibiscusworld.com/graft/graft.htm; http://www.hibiscusworld.com/graft/side.htm; http://www.westalley.com/ludick/grafting.htm; YouTube - Grafting at Sunset Chapter Meeting; YouTube - top wedge grafting of hibiscus.